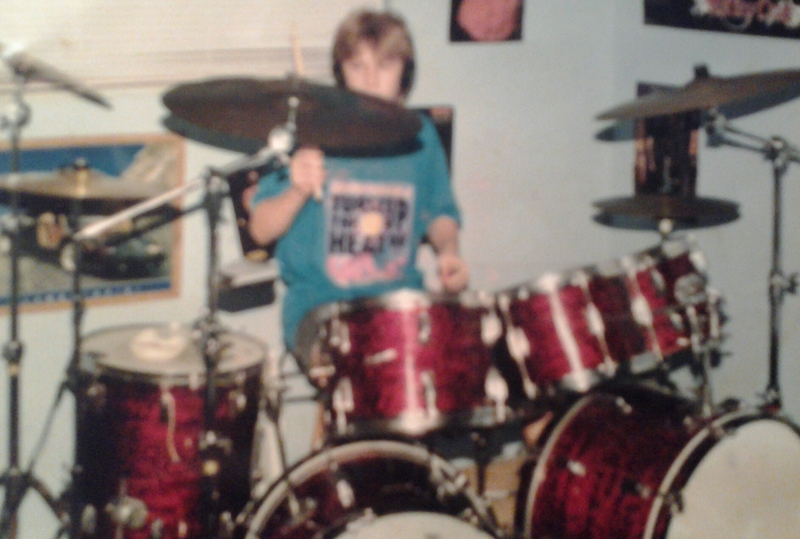 My first drum set was a Frankenstein’d Rogers kit that was partial Holiday and Tower series. Both were, luckily was their famous Red Onyx wrap. When you are a kid you don’t appreciate vintage drums, you are more impressed that your favorite players had huge Pearl kits, racks, bright shinny cymbals and whatever cool powder-coated hardware that was trendy at the time. Their were many times I wanted to sell my Rogers as a kid for some cheap, common kit for the sake that it was, “new and shinny.” As a 39 year old, I’m so glad I didn’t. I would have been one more experienced drummer who had the, “I had it and sold it” story. I’m very thankful for my parents who were able to get those drums when I was in early grade school and even more so that I still have those drums! My first Rogers kit! Me at age 10. Those drums helped grow my appreciation for Rogers drums. Rogers Drums were made in the U.S.A. and are no longer in production. I currently have four Rogers kits and now a 5th. 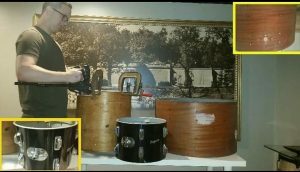 I thought I’d share my Rogers Restoration Project on that 5th drum set with you. It started with Ebay in 2009 and how I was able to find a 24″ Powertone series Rogers bass drum shell on the cheap. It was in bad shape and slightly crushed on the side. Disappointed that it was damaged in shipping, it was left in the basement of house and ignored until 2016. Here I am moments after I got the Rogers 13″ tom at a pawn shop on South Street, Philly! 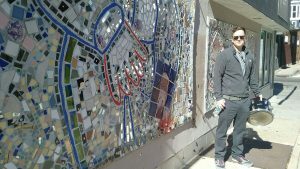 In 2015, my wife and I were in Philly. I have a tendency to go into mom and pop music stores and pawn shops to see what rare drums I can find. Sure enough on this trip I found a Rogers Powertone 13″ mounted Tom with hardware in great shape at a pawn shop on South Street. Best of all, the employee wasn’t aware of the value of the drum and sold it to me for $30! But it ended up in the basement as well. Winter of 2016, I was able to find a Rogers Powertone 16″ floor tom with all the hardware on Ebay. Shockingly, I got it for $78 bucks. Boom! 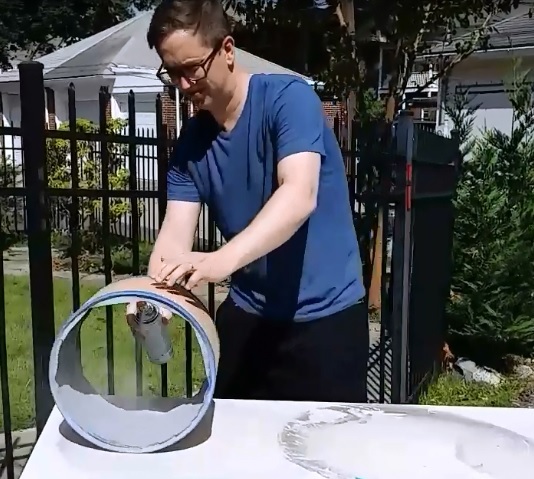 It started this project! 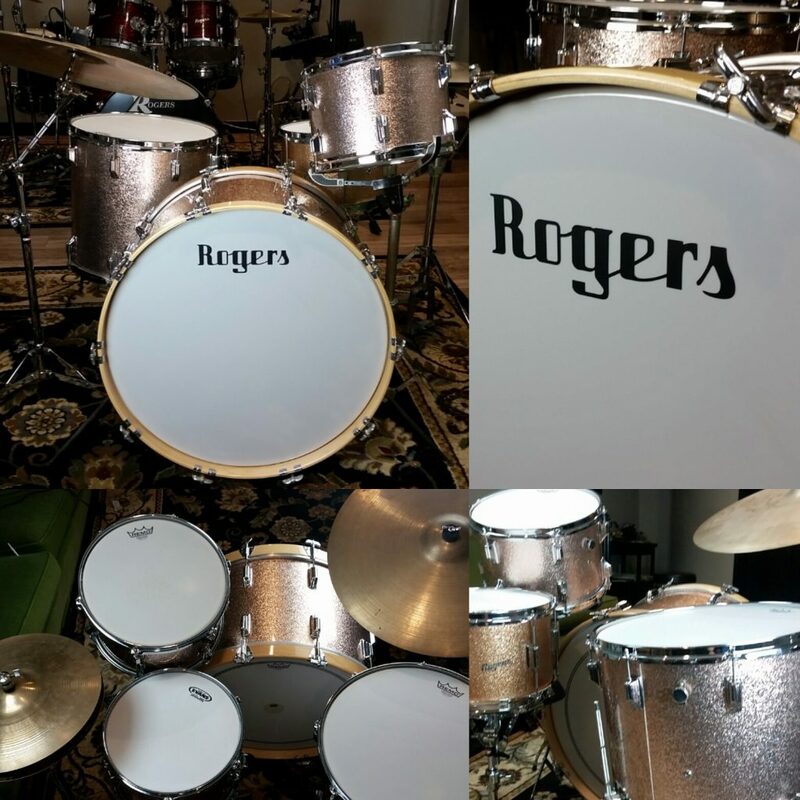 My Rogers Restoration Project with my 24″ bass, 13″ tom and 16″ floor tom. First came taking all the hardware and wrap off. Thankfully the bass drum had no wrap on it. But the floor and mounted tom did which is no easy chore. It took months for me to scrap and chip away the wrap due to Rogers using glue that was too good! The crushed bass was secured and fixed with car Bondo. “Strong like bull” now! Stripping the glue off the shells. Once the wrap was off, it took many coats of paint stripper to take off the chunky glue that Rogers used. 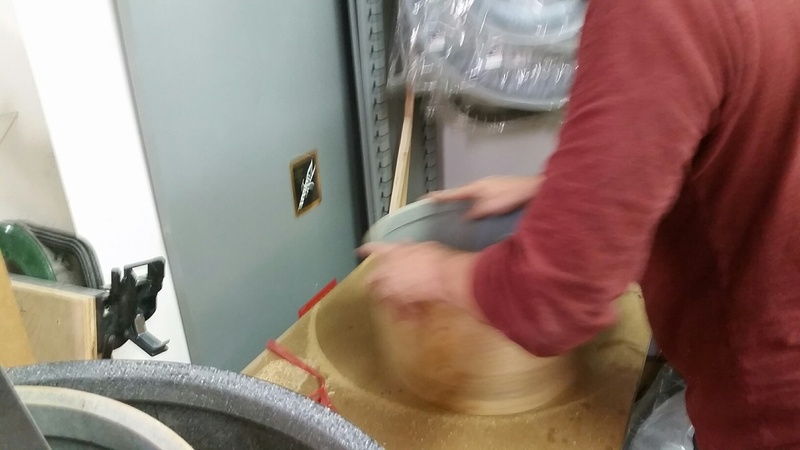 Trust me, this was the least favorite part of the process. The hardware was in rough shape. The chrome was pitted and rusted. Using the Diet Coke (citrus acid) and Tin Foil trick, I dipped and soaked the hardware in Diet Coke and scrubbed it using the shinny side of tin foil. It works way better than one would think. The hardware came very close to new looking! Cleaning the Hardware with Diet Coke and Tin Foil. Rogers had two primary colors for the interior of the shells; flat gray and speckled gray/white. 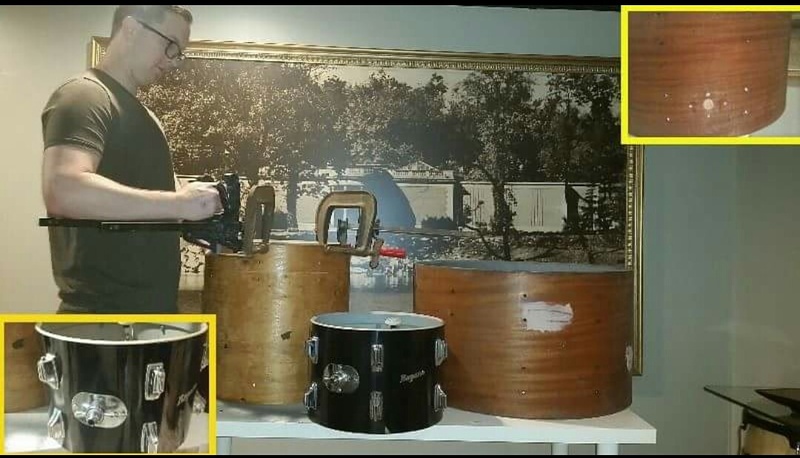 The bass drum interior was painted black by a previous owner and the toms were rough shape on their interior color. So I took the steps to recreate the original flat gray with a engine spray paint that was mostly a primer. It came pretty close. Painting the interiors with Primer Flat Gray spray paint. The bearing edges of the drums were blunt, bruised and chipped due to many years of existence and abuse. 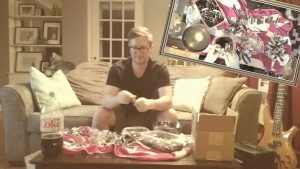 So I had Christian Kline at DrumsOnSale.com recut them using a 45 degree technique that he has perfected. I had many thoughts of what color to go with on the project. But thought Champagne Sparkle would be awesome. Mostly because Rogers did make drums with that color and I had a converted Rogers Tower series tom that I converted into a killer snare drum! The wrap was ordered from a Jamming Sam in Arizona. 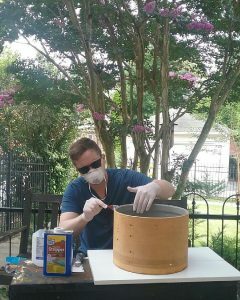 Finally the drums were wrapped using contact cement and hardware was put on. The Rogers logo came from DrumsOnSale.com. 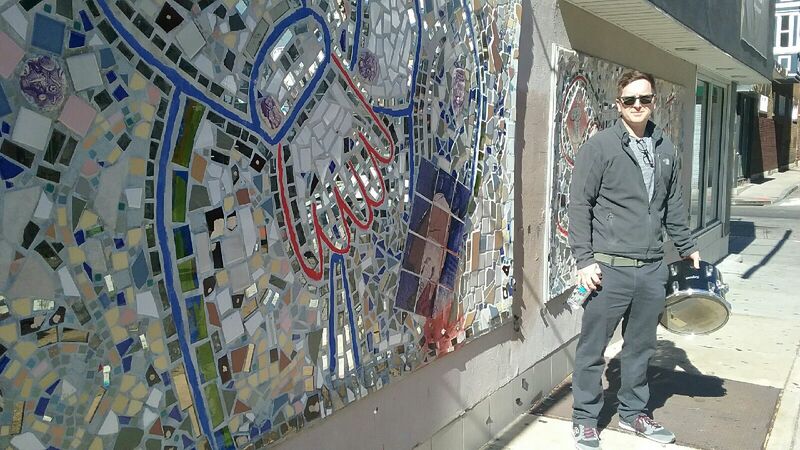 Look at the results of the project! They came out beautifully and sound WAY better than I expected. 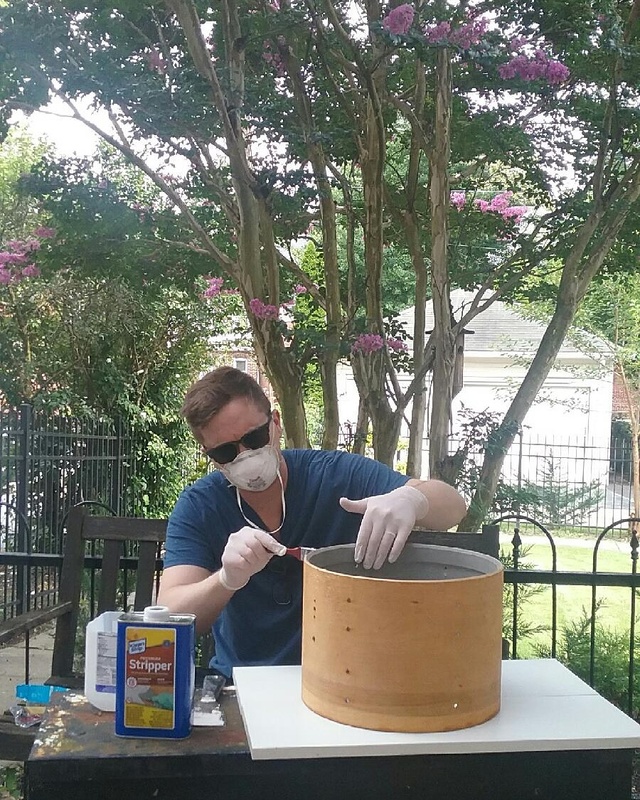 Vintage drums are work to get restored but extremely worth it! All done! Looking and sounding great! Sonny Emory = Drum Solo/Groove! If I had to name one of my top 3 favorite drummers, Sonny Emory would be in there! Here’s a great clip of him playing a solo and the band vamps a bit during it. He no doubt has chops but listen to that feel and finesse! Enjoy! This is a great groove that Steve Smith plays during the tune, “Nutville” during the Buddy Rich Memorial concert. The main sticking is RllRllRl with awesome variations in sticks and accents. Enjoy! Jeff Porcaro is the studio musician giant from the 70’s -90’s who worked with Steely Dan, Boz Scaggs, Toto and many more. His greatest grooves were “Rosanna” and “Africa” from his band Toto. In his instructional video he goes over these famous grooves. There’s a ton of videos of people demoing these grooves online but let’s face it, isn’t it better to go and watch it from the source? Enjoy! Cindy Blackman is fantastic on this on this Carlos Santana version of the National Anthem! I adore Santana but she steals the show here fusing New Orleans Second-Line grooves in the beginning then with solid John Bonham/Mitch Mitchell-esque grooves around 1:00 mark and finally a great bombastic ending! Check it out! Billy Cobham Shredding & Grooving! This is an amazing performance of drummer Billy Cobham shredding and grooving with guitarist John Mclaughlin and bassist Jonas Hellborg! Watch and listen for those amazing chops he has! 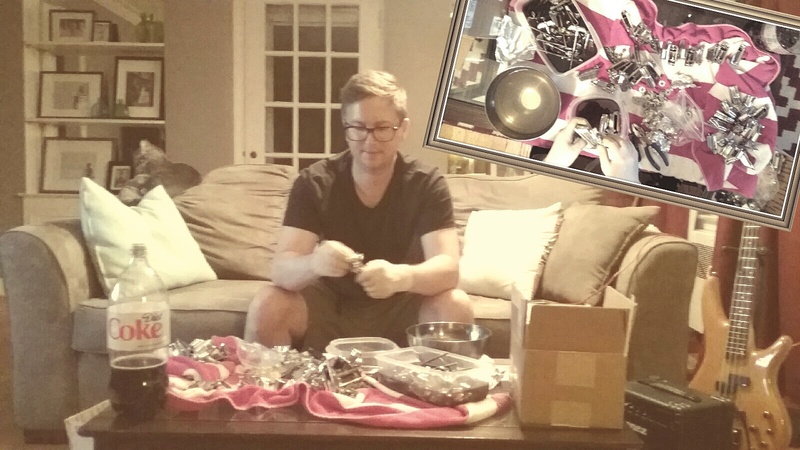 Joel Rosenblatt – Tasteful Chops and Good Attitude! Growing up in South Florida I had a great drumming education because of my teachers Jeff Lee and Matt Calderin. Both taught at Resurrection Drums in Hallendale, FL and that shop had drum clinics and masterclasses every week! I soaked it up. I took notes and audio taped all the clinics so I can go back and emerge myself in all the info. Out of all the drum clinics I’ve been to, Joel Rosenblatt took 1st place for me. Joel Rosenblatt whose best known for the fusion band Spyro Gyra was such a great clinician! He was greatful, funny, sharing and awesome player! I credit many people with me wanting to teach and one of them was Joel. Thanks Joel for influencing a young, hungry drummer! Here’s a great video clip of Joel and his tasteful, masterful playing! Omar Hakim and Daft Punk! Papa Jo Jones, Caravan Drum Solo! This is an amazingly stylistic drum solo by Papa Jo Jones on the classic tune, “Caravan.” Notice the total ease and minimal movement of his body while his wrist and angle do all the work. Fantastic! Simon Phillips is one of my favorite players. In this clip of him with the Buddy Rich big bang he’s playing to the song, “Dancing Men.” It’s a huge display of dynamics, groove and chops! This song makes you smile no matter what but his drumming on it is fierce! Enjoy!